Born in upstate New York to folksinging back-to-the-land hippie parents (Forest’s dad literally built the floor that Bob Dylan stood on at manager Albert Grossman’s Bearsville studios in Woodstock, NY). His mom heard Pete Seeger and Joan Baez play in her uncles’ living room in Boston and dated one of the Chambers Brothers before she met his dad). Weaned on a diet of Jackson Browne and Toots and the Maytals, some of Forest’s earliest memories are of his dad playing Poncho and Lefty by Townes Van Zandt and his mom singing Elizabeth Cotton’s Freight Train. Forest wrote songs with Rory Block when he was six years old, learned to juggle from WavyGravy when he was 9, and studied drumming with the late African master percussionist Babatunde Olatunji as a teenager. In college he played in a band with SNL star Maya Rudolph, They opened for No Doubt at the Catalyst in Santa Cruz before Forest left to study art in Spain. A pioneer of the DIY movement, he recorded his first record in his bedroom in San Francisco with bassist Seth Ford Young (Tom Waits, Edward Sharpe) and toured Europe for the first time, including playing at the Rally on Dam Square in Amsterdam for the Tibetan Freedom Concert. He’s played festivals from California (Strawberry Music Festival, American River Music Festival) to Europe (Belladrum in Scottland, Fiesta City in Belgium) and opened for such luminaries as Lyle Lovett, Bonnie Raitt, Steve Earle, Keb Mo, Brett Dennen and the Beach Boys (Forest met famed Beach Boys producer Van Dyke Parks at festival porch jam and later swapped songs at his house in LA). 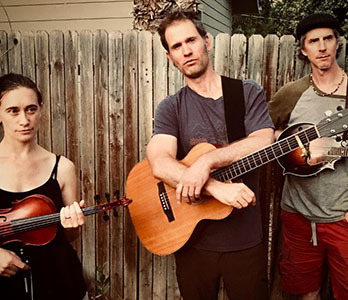 Collaborations include the jam band scene (ALO – Animal Liberation Orchestra on Jack Johnsons label) the bluegrass scene (Hot Buttered Rum), and indie folk artists like Jolie Holland. Forests songs mine his deep folk roots and embrace his love of gospel, reggae, Americana, country, soul, jazz and funk. Sun’s music has appeared on Showtime and MTV and in several film scores and soundtracks. He has also had several cameo roles in independent cinema including playing fireman in Who there? directed by Cassie Jaye and premiering at Tallgrass Film Festival. Forest is also a visual artist and his original paintings and prints have been shown at the Sala Lola Anglada in Barcelona and the Marin Museum of Contemporary Art. Forest resides in the Redwoods of Mill Valley, Ca when he is at home.